Kalakand: Kalakand or qalaqand also known as sandesh is a popular Indian sweet made out of solidified, sweetened milk and cottage cheese. Kalakand is made in Indian subcontinent during various festivals and celebrations such as Holi, Diwali, Navratri and Eid. 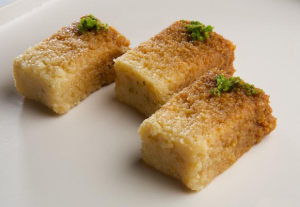 Kalakand is a traditional and delicious dessert, made with whole milk and is soft and grainy in texture. Boil 4 cups of milk in a heavy bottomed pan over medium heat. Stirring occasionally, making sure not to burn milk. As the milk comes to a boil, add in the lemon juice gradually, stirring the milk gently. As the curd starts separating from the whey, turn off the heat. Stir till the curd is completely separated from whey. Drain the whey using a strainer lined with cheesecloth, or muslin cloth. Wrap the curds in a muslin cloth, rinse under cold water and squeeze well. This process takes out the sourness from the lemon. To take out the excess water, squeeze the wrapped curds/chenna/cottage cheese/paneer. Note: Do not knead the paneer. Boil the remaining 4 cups of the milk in a heavy bottom frying pan on medium high heat. Stir frequently, as the milk burns easily in bottom of the pan, until the milk reduces to about two cups. Add the paneer in the milk and keep stirring till the mixture thickness to form a soft dough consistency. Cook, stirring continuously until the mixture becomes a soft lump and start leaving the pan from sides. Pour it over the greased plate keeping about half inch thick. Let it cool, till it reaches to room temperature. Garnish it with chopped almonds and pistachios. Kalakand is ready to be served. If kalakand is too soft put the plate in microwave oven (plate should be microwave safe) for 2 to 3 minutes. Make sure that the kalakand doesn’t become dry.